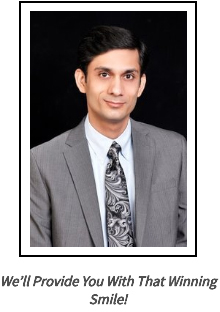 Welcome to New Smile Dental located in Ridgefield, CT.
Dr. Ashfaq Ahmad provides dental care for adults & children. He has been providing General and Cosmetic Dental Services to CT residents for several years. "I recently had a broken tooth removed and was treated with such care. I called at 11 AM and was seen at 2:30 that same day. Dr. Ahmad and his staff are so attentive. I recommend this Dentist highly." "I am always very, very happy with the service I receive at New Smile Dental! And this visit was no different. I had my regular cleaning and checkup done just the other day and my experience was excellent! Thank you, New Smile Dental!! See you next check up!!" "I've been doing to New Smile for about two years. Always a great experience. " "Went in for my 6-month cleaning and was pleased at the friendly and professional staff. Thank you!" "Like many, I’m not fond of going to the dentist. Perhaps because I like to talk. Dr. Ahmad is wonderful. He’s gentle, he explains as he goes and is very consciencious of my feelings. He staff is pleasant and helpful with insurance. You can’t ask for more!" "Our family is very happy with New Smile, they are all professionals, excellent results, flexible hours and in a few occasions, the Doctor walked the extra mile to accomplish my daughter's dentistry needs. Really appreciated. " "Very nice and clean good employee and knowledgeable drs "
"Very nice staff dr s r very knowledgeable"
"Maybe your pediatrician will not know this detail. But children get somewhat overwhelmed in a busy, big dentist with a lot of people, where the schedule is tight and there is only so much that can be done to wait for your child to adjust. Conversely, New smile dental is the best place for children because they will be so patient and helpful and meet your child where he or she is, that your child will LOVE going to the dentist, which is ultimately what you want. Try this place so your kids love the dentist. It is not about the toys and decoration of a place, it is about the people who work there. Here they will also get their end of visit treat.